Is it time to switch to electric vehicles? With some car manufacturers offering diesel scrappage schemes and the driving range of electric vehicles increasing all the time, is now the right time to consider switching for your business? There are over 5,000 charging points in the UK, so, along with the increasing driving range of electric cars, switching is beginning to look more feasible. Where do red or blue colour-coded drains actually go to? During a visit to a manufacturing plant the other day, I was pleased to note that the drains were all clearly marked with blue and red paint. As you may be aware, this is a fairly standard means of colour-coding, so I knew what it meant. However, the operatives I spoke to didn’t know what the colours meant. Do you and your employees know where different drains go to? Do they understand the implications? 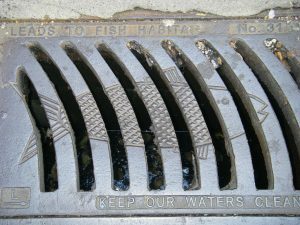 I loved these drain covers I saw in Vancouver, which make it absolutely clear that the drains lead to a local fish habitat. Does your organization source socially and environmentally responsible food? Fast food joints are not places that I go to very frequently. In fact, it had been years since I last went into a McDonalds – until a couple of weeks ago. I knew that they used British and Irish beef (who could have missed the advertising? ), but I was astonished to see that they also use organic milk, Rainforest Alliance tea, RSPCA assured pork and MSC certified fish. Similarly, when I visited my local Wetherspoons and asked them about the provenance of their fish, they directed me to a leaflet that told me exactly why they consider their fish to be sustainable, where they get their free-range eggs from, etc. McDonalds and Wetherspoons are both known for offering food at affordable prices. If they can buy responsibly-sourced food and still offer great prices to customers, can you? Is your emergency preparedness adequate? One of the (many) environmental impacts of Hurricane Harvey was a toxic plume from a chemical storage facility. The flooding associated with the storm had left them without power, which they needed to keep the chemicals cool enough to remain stable. I don’t know what emergency preparedness planning they had put into place, but clearly it wasn’t effective under those conditions. We are experiencing more heavy rainfall and more flooding here in the UK. We are also expecting to have more heatwaves. Are your emergency plans adequate to effectively respond to significant weather events? What are the environmental and business implications if they’re not? How do you report on key issues? I was with a company recently that uses A3 reporting in their business. I think it’s a great way of reporting – very easy to quickly understand what’s happening. One of their reports contained graphs showing progress against 16 key performance indicators. Another was used as their business planning tool. What information could you fit onto an A3 report, that would give an easily digestible, visual representation of key issues?